Monterey and Pacific Grove are two small, but stunning beautiful, towns on the south side of the Monterey Bay. These towns are seamlessly woven together and are often collectively called Monterey. Monterey is one of the premier vacation destinations on the central coast of California. Because of its renown, it can be difficult to enjoy the many wonders of this place on a budget. 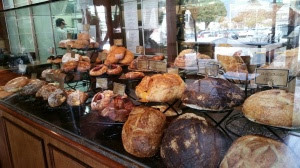 Pavel’s is hands down the best bakery in the whole Monterey region. It is a small locally owned shop that routinely sells out of everything they make, often times closing by early afternoon. I have yet to eat something there that I have not loved. A few of my highlight include the bomboloni (a little like a donut), any of the berry danishes, cream cheese filled croissant, and chocolate croissant. My favorite item at Pavel’s, the item I will drive miles out of my way to get, is their cheddar sourdough loaf. It is a large round sourdough loaf of bread with cheddar cheese marbled through the middle of the entire loaf. If that doesn’t get you in your car and driving to Monterey I don’t know what will. Tip: Get to Pavel’s as early as you possible can as they routinely sell out of their tasty treats. If you are full from your stop at Pavel’s, you made need to stretch your legs and go for a walk. There is a beautiful walking path (part of the Monterey Bay Coastal Recreation Trail) near Fisherman’s Wharf. After your stroll, make your way back to Fisherman’s Wharf for some delicious clam chowder tasting. 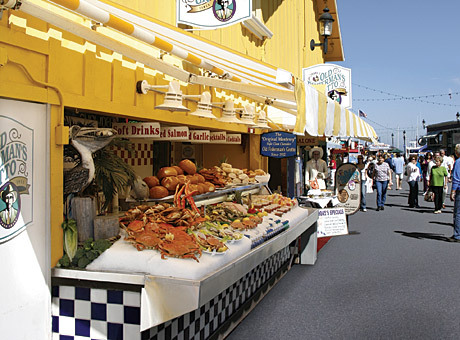 There are several seafood joints on the wharf that are competing for your business and all provide clam chowder samples. My personal favorite is the Fisherman’s Grotto’s thick, creamy, clam filled chowder. If you are ready for lunch you can pick up clam chowder in a bread bowl to-go for about $9. Tip: I would not recommend eating inside the restaurant as it is very overpriced. If you are buying clam chowder, buy it outside from the to-go counter. an exceptional place to take a paddle. 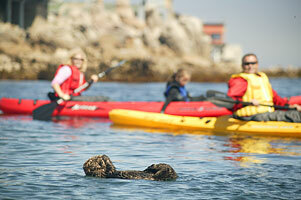 There are a number of kayak rental companies in Monterey/Pacific Grove, my personal preference is Adventures by The Sea. They have rental locations in Cannery Row, Lovers Point, and Breakwater Cove. I would recommend renting at Cannery Row as this puts you in position so see the most coast line and right in the midst of the kelp beds for the best chance of seeing wildlife. Adventures by The Sea has both single and tandem kayaks available. All kayak rentals are daily, rented at $30 per person, regardless of the type of boat you choose–single or tandem. If you are traveling with anyone I would recommend renting single kayaks as it is much easier to paddle a single kayak then a tandem. It also, allows for more flexibility in exploring the coast line at one’s own pace. your pizza, swing by a grocery store and pick up your favorite beverage. Now that you have pizza and drinks in tow, take Ocean View Blvd (turns into Sunset Dr. and follows coastline) and find one of the many pull outs to watch the sunset. If the sun is still out as you wrap up dinner, you might consider driving down Sunset Dr. a little further and take a walk on the boardwalk between Asilomar State Beach and the Pebble Beach Golf Course. It is an easy, gorgeous, walk with views of the ocean on one side and the historic Links at Spanish Bay. On the occasional evening you will be treated to bagpipes being played on the course while you walk. Tip: Click here to get the location of the boardwalk entrance. Free parking can be found along the road.